“We knew we wanted a house where we would really live outside, a house where the ocean breezes would blow through, and a house that would be a place in which we could gather our friends and family and entertain easily.” If that sounds like paradise to you, then you will revel in the pages of Bunny Williams‘ latest treasure, A House by the Sea. 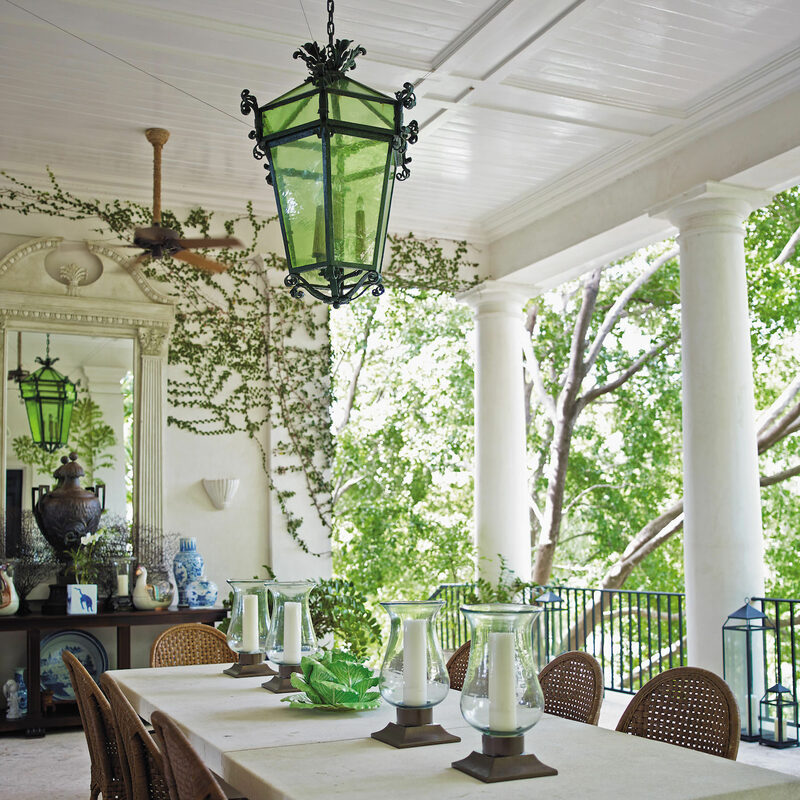 As in all her books, Bunny adds many practical tips along the way, including how using large scale pieces, even in exterior spaces, makes the surrounding feel more intimate or how mirrors on roofed porches, as in the dining area at top, can brighten a shadowy space. 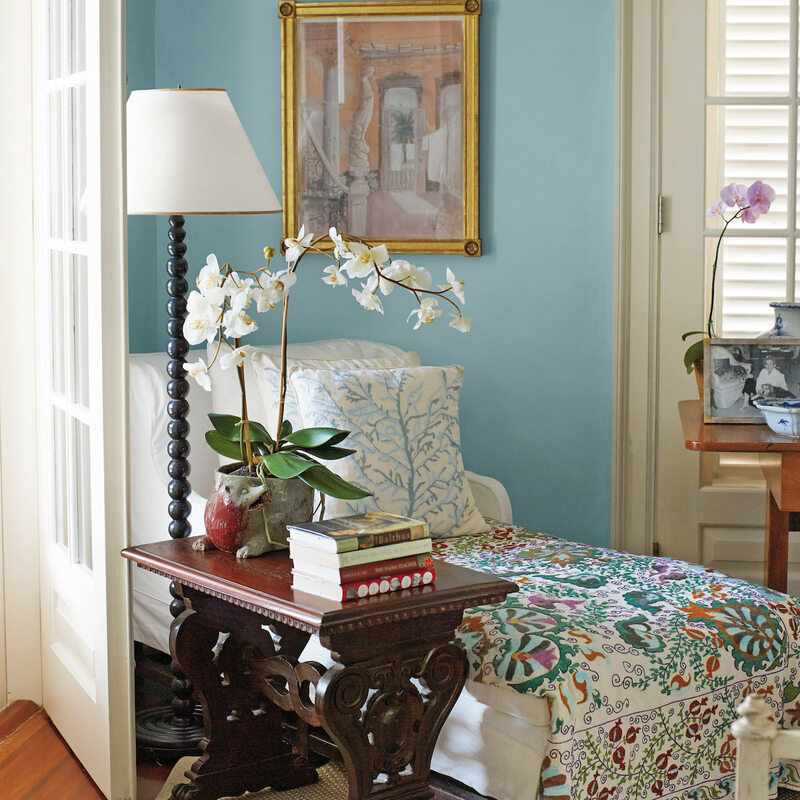 In the master bedroom, Bunny illustrates the art of layering details in this cozy corner, furnished with a large fourteenth-century English chaise draped in an antique Suzani. 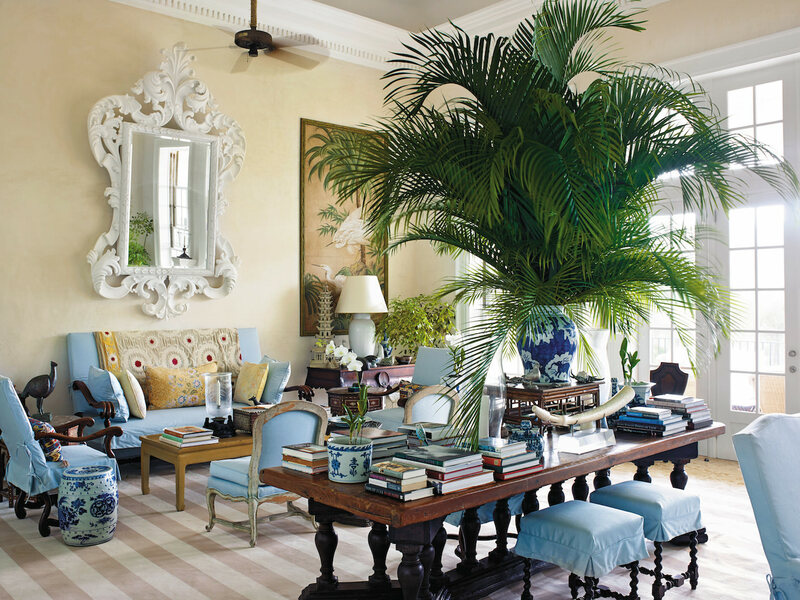 It’s eclectic, it’s appropriately tropical and it tells a story! 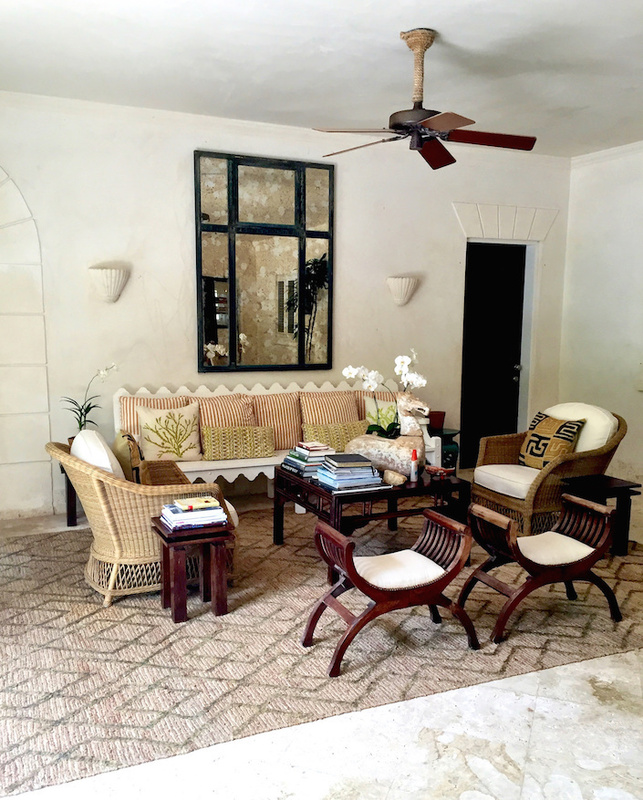 “Making Guest Rooms Gracious” is a chapter that explains why an invitation to La Colina is such a coveted commodity. 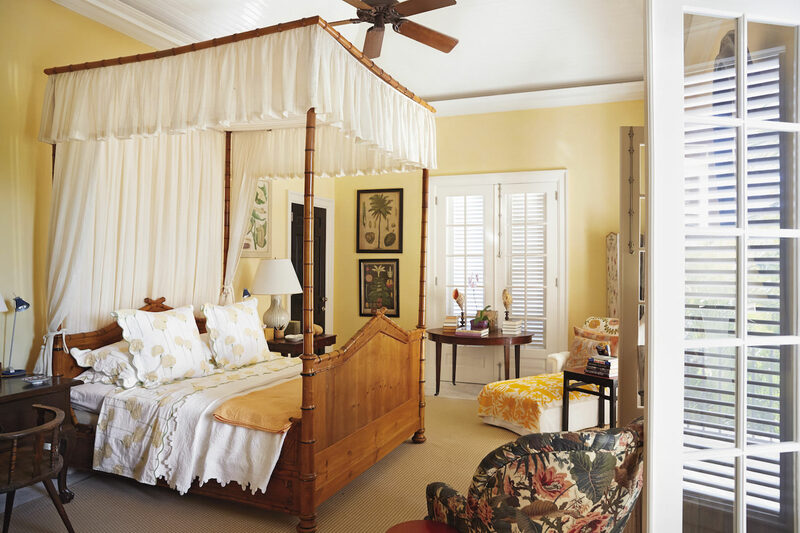 Who wouldn’t want to sleep in a giant nineteenth-century bamboo bed in the beautiful yellow room above, which, as with all the guest rooms, opens onto a loggia with comfortable chaises for reading or napping. Or where everything from a selection of hand picked books and electronic charging stations to terry robes, mounds of fluffy towels and a spare hair dryer (we’ve all experienced the dreaded island hair) are thoughtful additions. Entertaining is an important aspect of La Colina and Bunny and John have it down to a relaxed and stylish science. John is master in the kitchen and Bunny at the table. 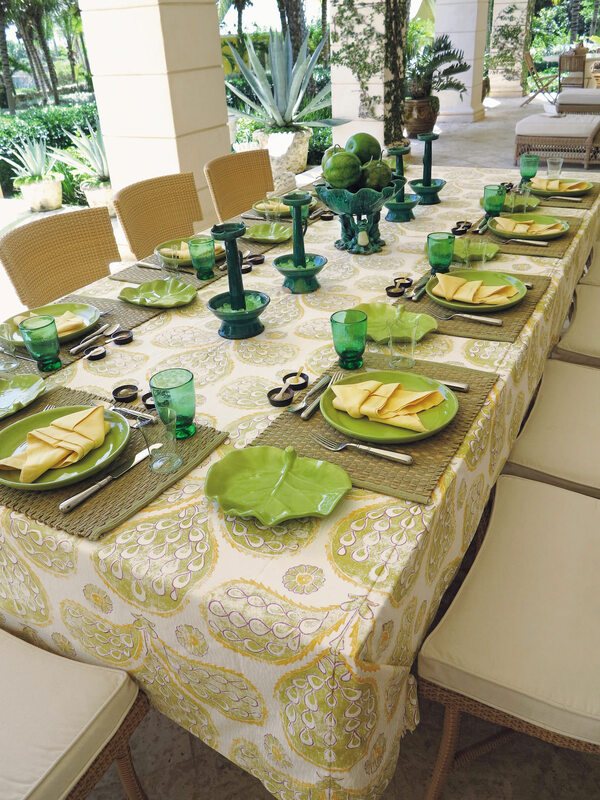 She has accumulated a vast collection of china, glassware and linens so that each meal can be a different and creative tabletop delight. Last spring, when I was in the Dominican Republic on vacation, Bunny was kind enough to arrange for me to visit La Colina. I can personally attest to the magical aura of this very special House by the Sea. 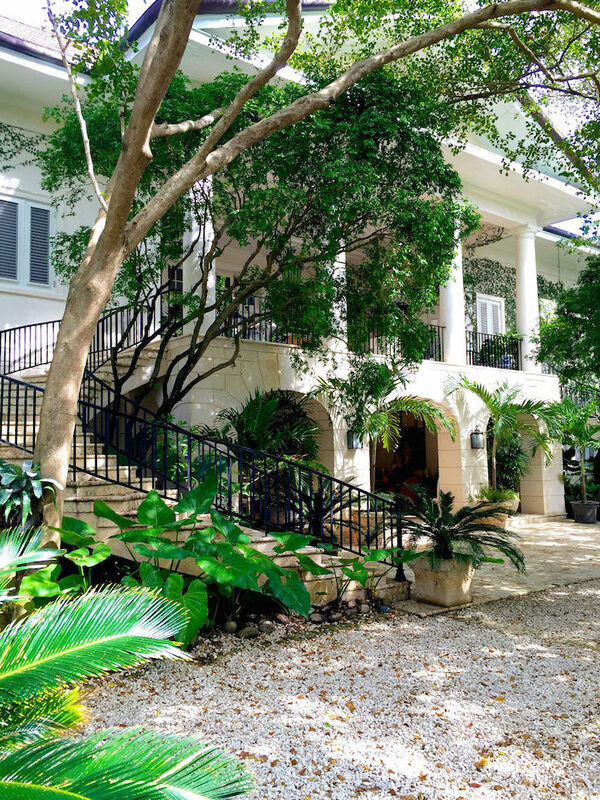 I am including several of my photos which echo what you will see in the book, such as the gracious entrance above, where the architecture feels like one with its natural environment. La Colina was built on a hilltop with the main living spaces on the second floor to take advantage of the views and to capture the breeze. Downstairs is a charming indoor/outdoor space, one of the many places throughout the house to sit, read, chat or even nap. 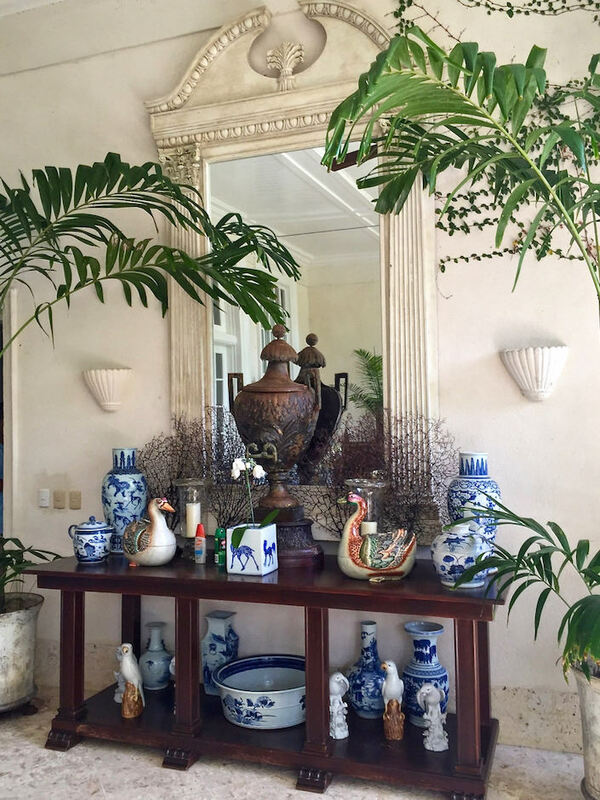 Bunny said that one of her favorite aspects of furnishing La Colina was choosing books and she has included many of my favorite authors such as Somerset Maugham and Graham Greene, who wrote about tropical destinations with wit and insight. 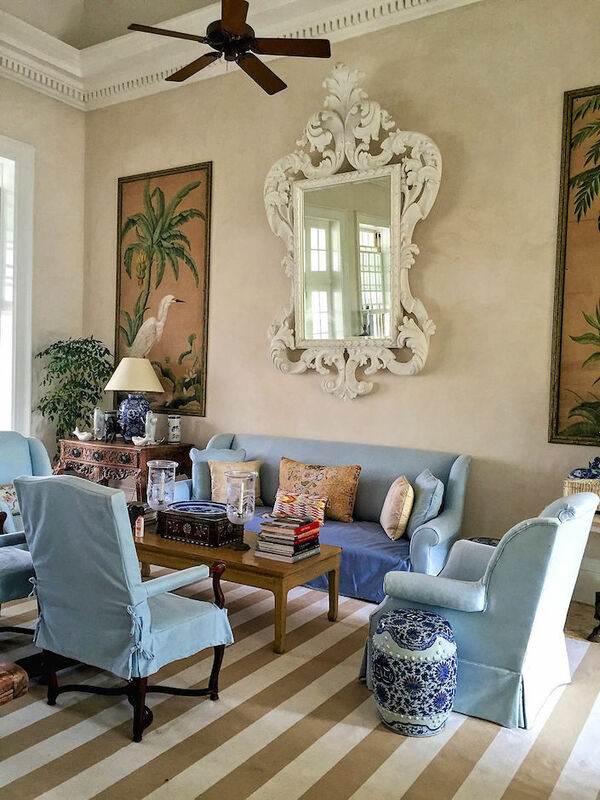 giant mirror and capacious sideboard filled with John’s beloved blue and white, the feeling is cozy and intimate. The book is filled with fun anecdotes like the story of a pair of mirrors Bunny found at High Point that were the right size but with an awful finish so she painted them white to look like a Dorothy Draper plaster effect and voila – perfect! But you’ll have to get the book to read about how John commissioned the panels on either side – a great design story fueled by a well traveled and educated eye. A House by the Sea is the tale of many things but mostly a story of well lived lives. Bunny and John have a passion for beauty and the art of living matched by very few. You will dive in and emerge refreshed and inspired – what could be better?! Well maybe an invite to La Colina. This entry posted in architecture, books, furniture, garden, interior design, travel. 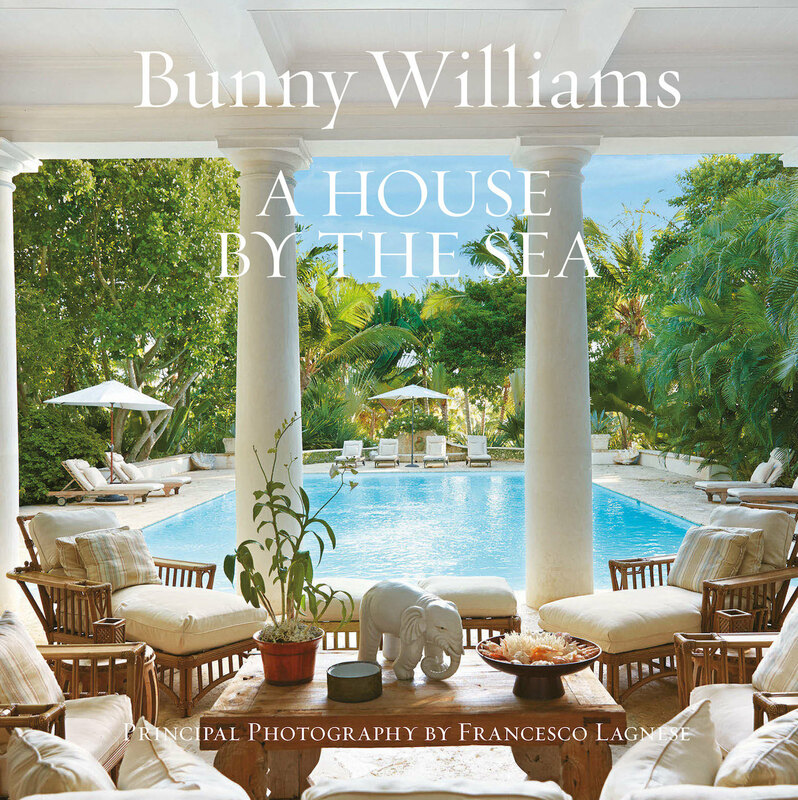 Entry Tags: Bunny Williams, Bunny Williams book, design book, Dominican Republic, interior design, Travel Bookmark the permalink. I am sorry if I have given that impression Dolores because this house is exactly the opposite. Simple, relaxed, filled with the things they love – just like their beautiful Connecticut home. Beautiful work. 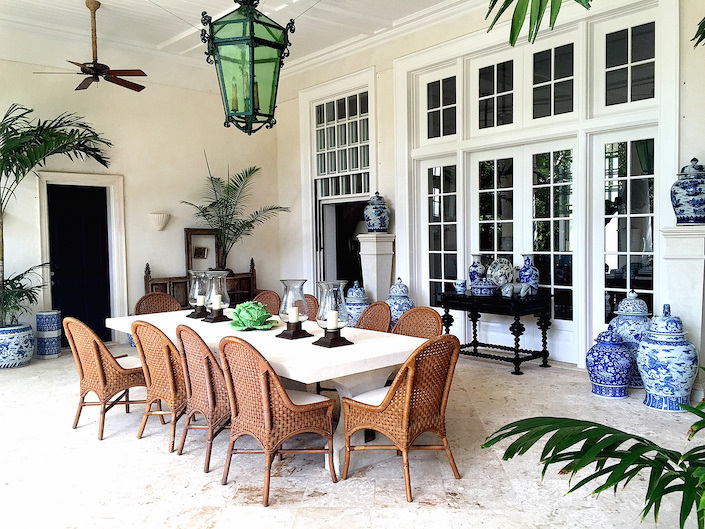 I admire her ability to layer patterns and styles, mixing new pieces with antiques. Looking for to her book signing! Such a magnificent home! Curious some of the photos have product bottles, is this intentional or accidental? No bodies perfect :). Ha Robbie – those are my shots! And I think it’s sun screen! So many times designers sacrifice comfort for form. What attaches me to Bunny’s design style is how comfortable everything looks. 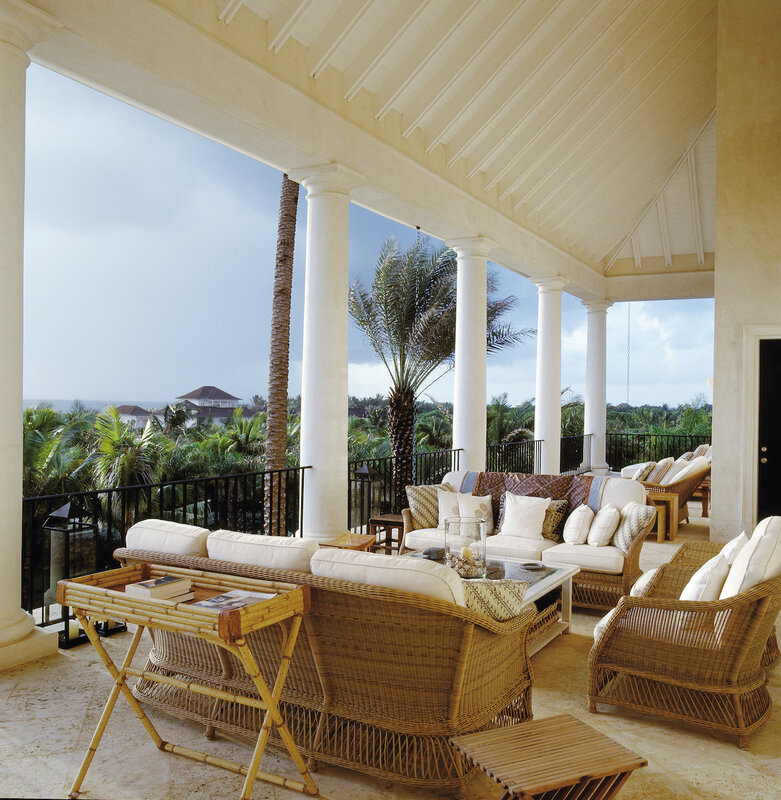 Chairs and couches are ample and reasonably covered so guest enjoy the beautiful surroundings. Takes my breathe away! Beautiful! 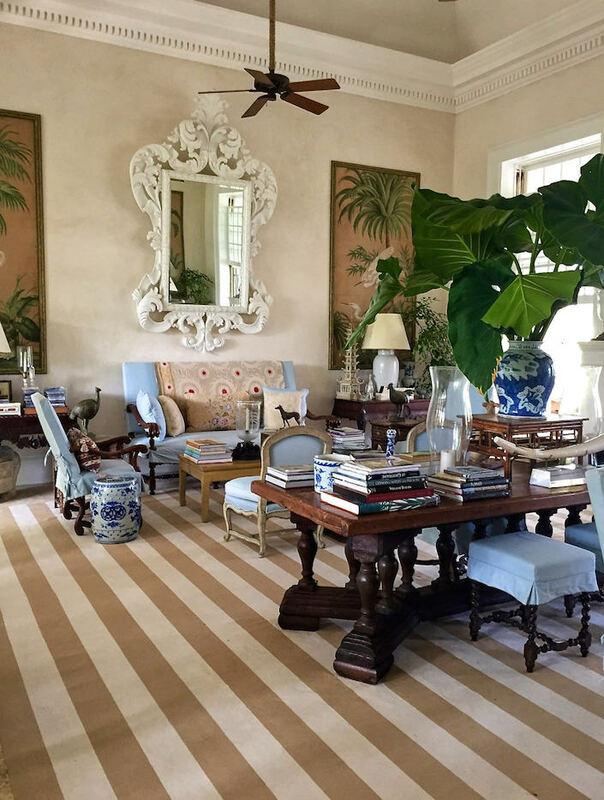 Love Bunny Williams and her home collection is the best. I have spent many happy hours pages through this gorgeous book!… Beautifully captured by you Stacey..
She is such a brilliant talent. 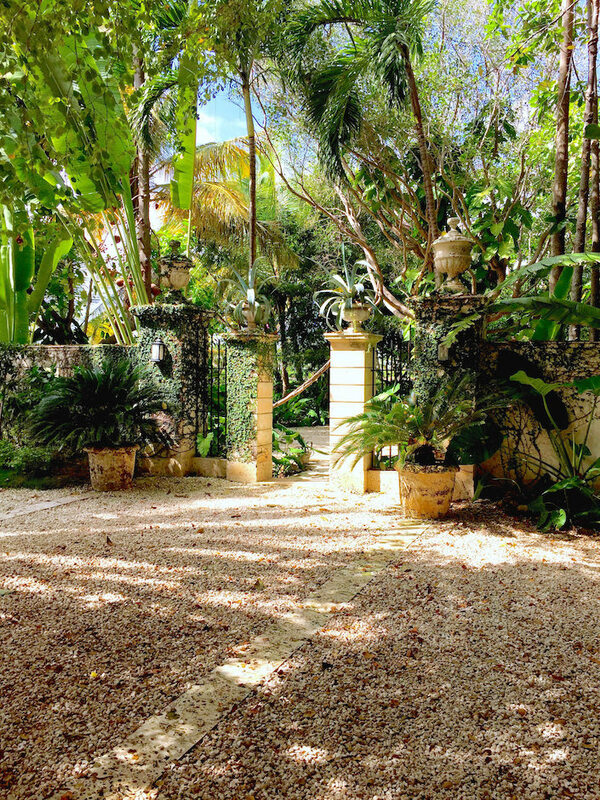 As an interior designer for over 40 yrs., I continue to feel inspired by her work; both in her houses and gardens. Please continue to share with us your creativity for many years to come. 82 queries in 0.578 seconds.